The 2012 post Can the Commonwealth Bank’s “Can” beat the other big four banks reviewed the authenticity of the brand promises of the major banks. This made the case that Commbank’s superior technical systems could allow it to credibly build its “Can” positioning to stake out brand leadership amongst the big four. As outlined in the posts Do brand promises really influence customer satisfaction? The case of the big four banks and Commbank’s “Can” brand authenticity helps make it #1 in customer satisfaction?, Commbank’s rise in customer satisfaction ratings since the launch of the “Can” campaign may been seen as at least partial evidence of this occurring. Other recent facts to hand add more support for this view. JMK’s 2013 Mood Meter Study of Middle Australian families unsurprisingly confirmed that there is little love lost between ‘average’ Australians and the banks. The study reported that the banks’ “delaying tactics and then failure to pass on the full RBA interest rate cuts” over the past year were the defining points in people’s long-held negative perceptions of them. What was more enlightening was the finding that consumers “Instantly dismissed [bank advertising] as unbelievable. The imagery of caring organisations that are on your side is at odds with most people’s real life experience”. This is telling given that “we care” has in some form been the default platform for all of the banks’ advertising (including Commbank’s previous campaign) over the past few years. This is not to say none of it has been effective. After all, people’s self-reported rational responses are often different from their emotional takeouts. However in an increasingly transparent world populated by cautious and cynical post-GFC consumers, the ability of the banks (or any other organisation) to either “fool all of the people some of the time” or “fool some of the people all of the time” is rapidly diminishing. What is worth noting then is the “Can” campaign’s departure from the “we care” norm. While the campaign doesn’t say “we don’t care”, customer wellbeing is implicit rather than explicit. The focus is on the bank’s technical capabilities and what its customers can do with them. Its “believability”, in contrast to generally “unbelievable” bank advertising, is another factor in its favour. As outlined in the post noted above, the NAB with its “More give, less take” positioning and “Break Up” campaign has been widely acknowledged as the pacesetter for the past couple of years. For instance, as of August 2012 the campaign had been credited with signing up a million new customers in its first 18 months. Apart from some highly engaging communications, the success of the “More give, less take” strategy has been underpinned by evidence (albeit at times thin evidence) that the bank has actually been living up to this promise. Its first proof points were the abolishment of overdrawn fees and a range of different fees – like monthly account keeping fees – on transaction accounts. Since then a key point has been the NAB’s commitment to offering the lowest standard variable home loan rate of the major banks, which it adhered to through 2012. However, after three and a half years of offering the lowest rate, it has declined to renew that commitment for 2013. (At time of writing Commbank’s rate stands at 5.70% to the NAB’s 5.73%). This appears to have been driven by two factors. Firstly, low growth in the overall loans’ market, triggering more aggressive rate offers from competitors. Second, lower overall profitability compared to the other big four (largely due to underperforming international operations), pushing it to get more from its already highly profitable Australian business. Regardless of the reasoning, the NAB has removed a long-standing and much touted support for its brand promise. So its challenge now, as stated in the original post, will be how to visibly stay ‘fairer’ than the other banks. Its focus on doing this may well be diverted by its broader business imperatives to generate $800 million in cost-savings while reinvesting to overhaul its outdated technological systems. A move that mirrors the priority its rivals are placing on technology and acknowledges the Commonwealth Bank’s leadership in this area; and maybe has even been prompted by how Commbank is leveraging its technological advantages within its “Can” campaign. If, and as, these circumstances force a disconnection between the NAB’s brand promise, business strategy and operational realities, then its brand authenticity will falter and further open the door for Commbank to gain brand ascendency. 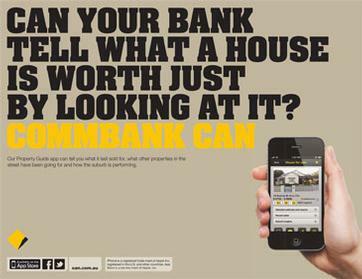 « Commbank’s “Can” brand authenticity helps make it #1 in customer satisfaction?